The Deluxe 19″ Fly Weight Aluminum Transport Chair with Removable Casters by Drive Medical weighs about 30% less than traditional transport chairs. Weighing only 19 pounds, this chair has a hassle free, aluminum back release that folds down the back, flared arms that allow flat folding and the lightweight aluminum frame combine to make this chair easy and convenient to store and transport. 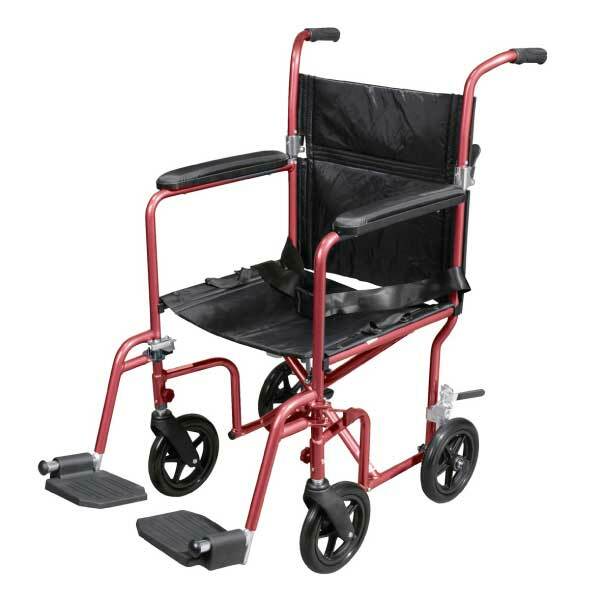 The removable, composite, 8″ caster wheels in front and rear with rear wheel locks and quick release axle, provide a smooth transportation over most surfaces. Has a soft, plush upholstery, a seat belt for added safety and a carry pocket on backrest to easily and securely transport personal items.